Patricia Wheeler, one of the artists in this month's RFS show, will welcome gallery visitors to hear about her works in the show and her unique artistic process. On my walks, my hands gather cones, leaves, bits and pieces of the forest or from my friend's farm. I wrap and bundle these “samples.” I learn the term “field notes” from the scientists. So, my bundled studies become my field notes. 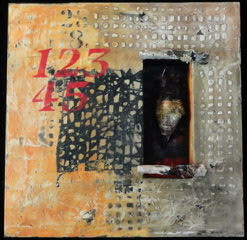 Matt McCalmont, from Portland, makes me substrates with recessed boxes to hold the objects, like reliquaries. I call these pieces RIVERAIN SPIRITS. My painting practice is part ritual. I am sure it is my catholic roots! The ritual soothes me and informs the work of it's sacred energy. These Riverain niche pieces are granaries. They hold my bundled samples from the natural world …. stored for safe keeping in these turbulent times of extreme weather and political upheaval. 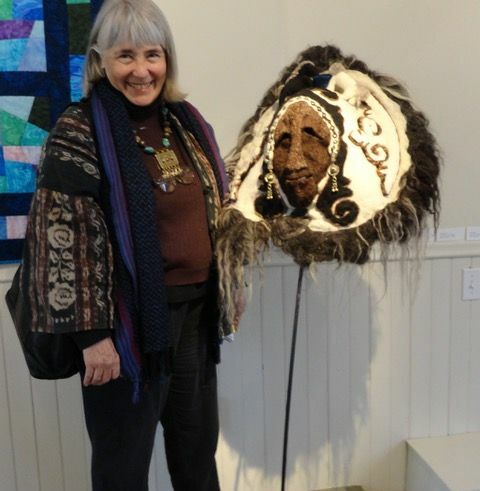 Susan Merrill's displayed work is traditional masks composed in felt. Her presentation will include the short film Other Faces: The Origin of the Zati Mask.